Royal College of Art graduate Christophe Machet uses a huge custom-built CNC machine to transform "poor and unsexy" sewage pipes into chairs. Paris-based Machet presented the project, called Pipeline, inside an old panettone factory during Milan design week, as part of the Alcova exhibition. The aim of the project is show how existing production lines can be exploited for other uses. Machet's design can be cut from a standard mass-produced sewage pipe. Thanks to the cheap and durable properties of PVC, as well as the natural curvature of the pipe, this component can be transformed into a functional seat and backrest. "I like to find poor, unsexy materials and find a way to turn them into something more interesting," Machet told Dezeen. "This PVC sewage pipe is an interesting material because it is made to be cheap and very durable and to last for decades." Machet has built his own CNC machine to cut the chairs, meaning the chairs can be quickly and easily assembled on demand. Once cut, they are then spray painted in white, yellow or red. 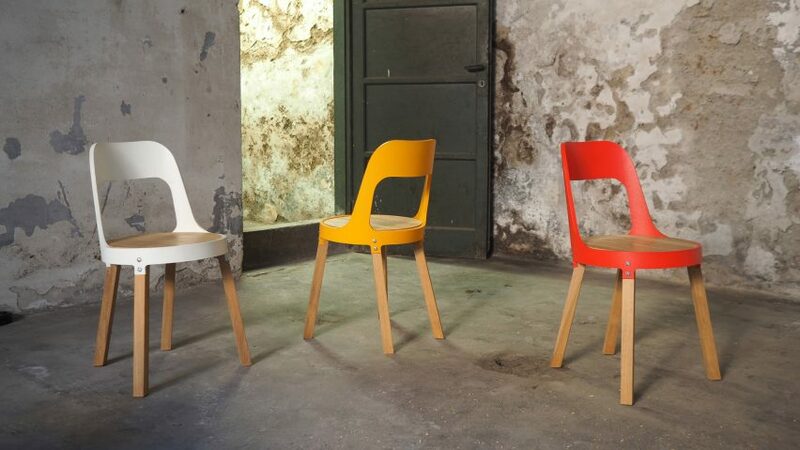 The legs of the chairs are simple lengths of plywood, left with a natural finish. "Unlike other plastic furniture, the ingenuity of the Pipeline chair is that it is not moulded but rather cut out from a sewage pipe with a custom-made apparatus sized to fit an entire three-metre long pipe, allowing for the production of a curved chair to be made within a reduced amount of time and labour," explained Machet. "The Pipeline Project is both a machine and furniture collection that is at once environmentally conscious and open to the powers of imagination." Christophe Machet is based in Paris. He graduated from London's Royal College of Art in 2012, having previously studied at ECAL, and his work often draws upon his background in both engineering and product design. His Pipeline Chair was on show from 17 to 22 April 2018 for Milan design week. Other projects on show At Alcova included Lara Bohinc's first collection of chairs, which were inspired by the shapes of planets and their orbits.